DS: THE STAR'S MDKP LOCHINVAR W.P. 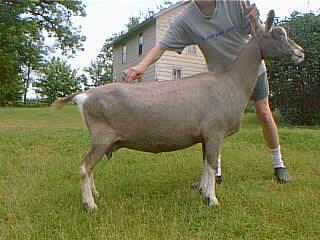 Firefly was my very first goat. She's the Queen of the farm & isn't fond of showing so usually stays home, bossing everyone around. The few times she's gone out, she's done quite respectably . . . usually in the upper half of the class & even won her class twice! We were pleased with how she appraised as an 8 year old, scoring Excellent in the areas of Rear Legs, Back, Rump, General Appearance & Body Capacity; Very Good in the areas of Head, Front Legs, Feet & Dairy Character (appraiser commented that she has an Excellent Head but for her facial stripes needing to be just a little more prominent) & + (Good Plus) in all other areas.